"When three weeks old, he came with his parents to Illinois. They made the entire trip by water, settling near Princeville in Stark County. it was here that he received his education, and then helped with the work on the farm. When 18 years of age, he went to Kickapoo, Illinois, where he was an apprentice in the wagon making trade. He completed his apprenticeship with the firm of Hoope and Foltz in Peoria. Mr. and Mrs. German came to Princeville, Illinois in 1875, where he openend a wagon and blacksmithing shop under the name of German and Gillen. He later purchased an interest in a hardware business and operated that business in connection with his other business. In 1890, he sold an interest in his business to J.S. 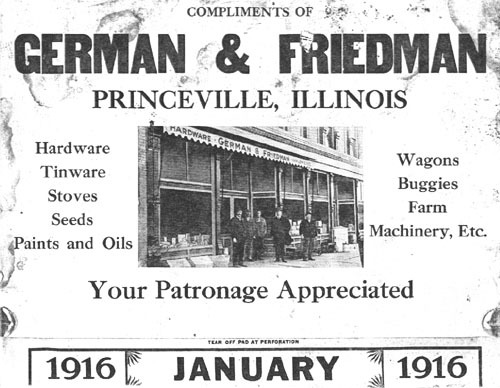 Friedman and the firm operated under the name of German and Friedman for 30 years. Mrs. German died in 1920, and was buried in St. Mary Cemetery, Princeville, Illinois. That same year Mr. German retired from his business. A sister of his wife, Miss Annie Heinz, kept house for him for the next 15 years. She later retired to St. Francis Hospital in Peoria. In 1935, he made his home with his son, Frank. He spent much of his time in the garden, and was a great lover of flowers and fruit trees."